Pattern Shapes, by the Math Learning Center | Clarity Innovations, Inc.
Students use Pattern Shapes to explore geometry and fractions, creating their own designs, or filling in outlines. As they work with the shapes students explore geometric relationships, think about angles, investigate symmetry, and compose and decompose larger shapes. Many of these explorations lead naturally to thinking about fractions as parts of a whole. 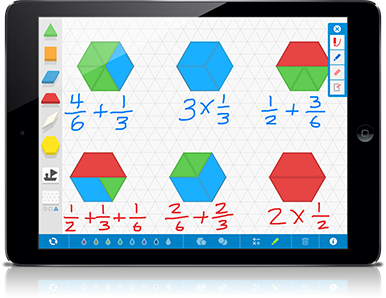 For more information about Pattern Shapes and other apps, visit: www.mathlearningcenter.org/apps .